Made the rounds and found many bagworms on the red pines in the back yard. These are insect pests that you pick off by hand. In years past I have found them on the sweet gum trees, but this year they have favored the spruce and pines. Most seem within arm’s reach and they tend to be on the leeward side of the trees on my windy plat. Check your plants to see if you have any. I remove them and burn them. 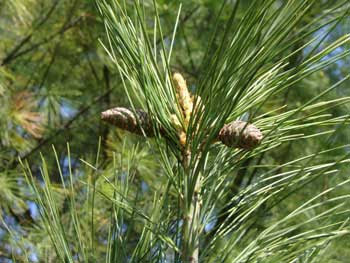 The first photo is a normal pine shoot and budding cones. The second picture shows the bagworm and their nefarious natural disguise. 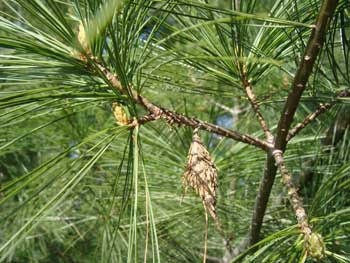 Roberts recommends putting the bagworms in kerosene or diesel fuel. She cited an instance in which a woman picked the bags and then put them in a garbage can in her garage. The next morning, all of the worms had escaped and taken over the garage ceiling. Boyd suggests simply putting the insects in a tightly sealed bag before disposing of it. Other ways to rid them from your plants? Now there is hope of deterring the bagworm pest altogether. New studies at the University of Illinois at Urbana-Champaign show promise that planting members of the Aster family near and/or around the susceptible tree will attract a natural predator of bagworm, ichneumonid wasps. Larvae remain in their bags as they feed and move about. materials and shed skins can be eliminated. opening of their bags and enter the pupal stage. I don’t see many and always destroy them when I do. Weird little bags that almost look like a cone with a passing glance. i have noticed these on cedar trees and thought they were some kind of cone….we do have lots of the webby worm-nests, but down here they seem to always prefer wild cherry trees with tiny black fruit…kind of a trash tree here anyway, so as long as they stay there, i leave them alone. and jays, often get right up there and pig out.